Earlier this year Skift analyzed messaging between travel brands and consumers to be one of the megatrends for the travel industry in 2016. What are the benefits of messaging between travel brands and consumers and how to get started as a travel business? 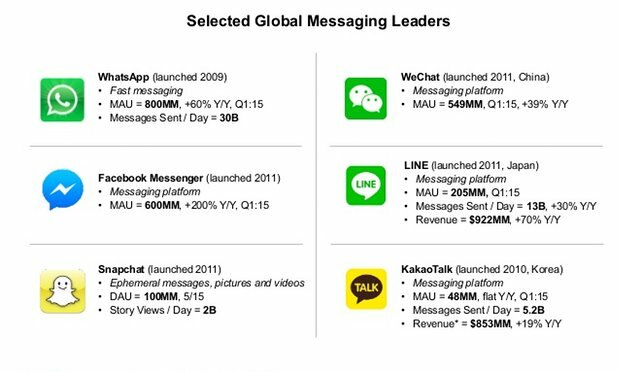 While social media have grown substantially over the last years, consumers now spend more time using messaging apps like Facebook Messenger, WhatsApp, WeChat, Telegram, …. 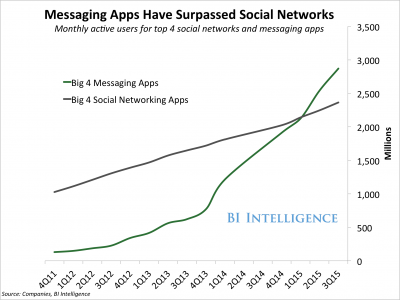 Since early 2015, the top 4 messaging apps have more monthly active users than the top 4 social networks combined. Messaging apps are present on nearly every smartphone and the first brands are exploring this channel for their customer service & commerce. Messaging apps provide travel brands with a real-time access to their guests or customers while travelling. The frequent daily usage makes the messaging apps also one of the favorite apps for consumers, unlike the many mobile (travel) apps that get installed but hardly ever used. 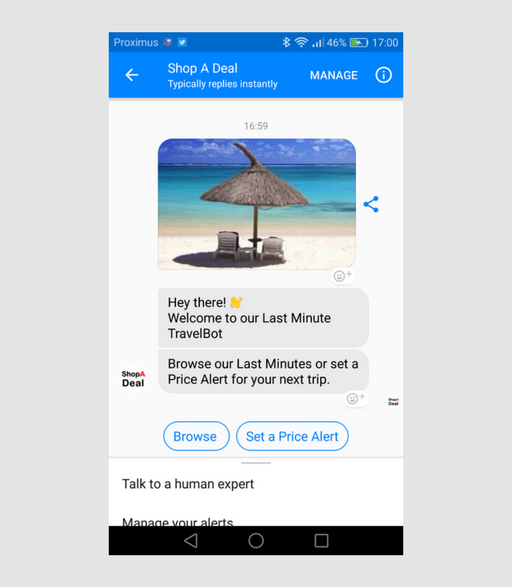 As we described earlier in our post on conversational commerce, messaging is considered to change some fundamentals of the (online) travel industry, including the dominance of search engines like Google. The messaging trend creates new business opportunities for travel brands to be explored. While new travel startups like Lola and Pana use messaging to create new business models in travel, existing travel businesses should also consider messaging with their customers. 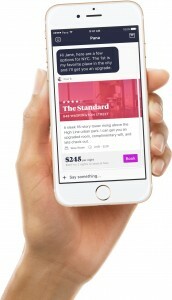 With the upcoming of specialised tools for conversational commerce & customer service, messaging with your customers and guests can easily become part of your customer engagement strategy. The search box has always been the universal solution for any consumer journey in travel. Wether via the search box on your website or via Google.com, searching has been the universal method to get jobs done by travellers. Messaging offers a unique opportunity to break down this tyranny of endless searching efforts via the real-time availability of human experts at any moment in the customer journey. The conversational nature of messaging allows for a real personal connection and understanding with your customers. Messaging apps are clearly designed for connecting people within the metaphor of a real conversation. Previously social media have shown us the potential for customer service and brand interactions. The private nature of messaging allows for more in-depth conversations between brands and consumers. Travel brands can engage in private conversations to discuss ideas, complaints or deliver a personal service on the go. Scaling these conversations to a large group of customers might be a challenge for (travel) brands. With specialized tools for conversational commerce, teams are now able to collaborate on incoming conversations with a shared team inbox. These tools will help travel business to scale up their conversations over time. This scalability will also be further enforced by supporting technologies such as AI (Artifical Intelligence), machine learning and bots on Facebook and Telegram. The real-time nature of messaging apps allows travel businesses to have a unique real-time insight in the customer journey. Messaging a business while travelling is extremely simple for any consumer. No additional app installs needed , they can use their preferred messaging app to contact your travel business. For travel businesses, the actual travelling phase remains an untapped phase in the customer journey. While resolution of urgent customer problems might be a first priority to tackle, messaging also allows for new personal services to be discovered. Concierge services, membership advantages or loyalty programs can be enforced by throwing in the human expertise on the go via messaging. As seen earlier with live chat, messaging might have the potential to be more efficient for customer service than email or phone conversations. Although not all service interactions will be appropriate for messaging channels, a large amount of service interactions could be handled via simple conversations between consumers and travel businesses. Using messaging apps for customer service and commerce allows your team to be more efficient in handling customers requests. Specialized tools like Letsclap.io offer a shared team inbox for your conversations. Conversations can be distributed across team members and handled by the right expert in your team. Every expert is able to handle multiple conversations at the same moment. Your team capacity for customer engagement is higher than with email or phone conversations. It is clear the messaging age delivers a huge opportunity for travel & hospitality businesses. The massive reach in combination with the characteristics of this channel make it an absolute winner for travel businesses of all kind. Before you start, consider your engagement strategy and select the appropriate tooling to handle these consumer conversations at scale.